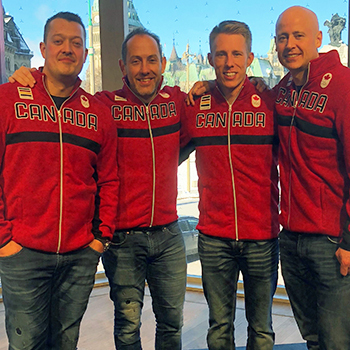 Laurier alumnus Brent Laing, second from left, will compete as part of Team Koe at the 2018 Winter Olympic Games. Wilfrid Laurier University alumnus Brent Laing will realize a 20-year dream when he takes to the ice in Pyeongchang, South Korea, as a member of the Canadian men's curling team at the Winter Olympic Games. “It’s 99.9 per cent excitement," Laing says of competing in his first Winter Olympics. "I’m sure there will be some nerves at times, but right now it’s pure excitement. One of the best things is being a part of Team Canada, not just the guys on your curling team, but the entire Canadian team. We’re going to try and soak that in as much as possible and soak in everything the Olympics has to offer. We’ll also allow ourselves the time to focus on what we’re there to do – and that’s to bring back a gold medal for Canada." Laing plays second as a member of Team Koe, which also includes skip Kevin Koe, lead Ben Hebert, third Mark Kennedy and alternate Scott Pfeifer. Team Koe qualified to compete in South Korea by winning the Canadian Olympic Curling Trials in December. Laing, who served as player-coach of Laurier's men's curling team during his time at university, says competing at the Olympics has been a goal since 1998. "That's when the Olympics welcomed curling back in as an official medal sport, when Mike Harris and Sandra Schmirler went to Nagano, which coincided with my first year at Laurier," says Laing. "At the time, I was also a part of the best junior team in the world outside of university. So it started to feel like maybe that was a dream that was attainable. It certainly was a dream, but it started to become a little more realistic as we started to have success. So it’s been a 20-year goal and a 20-year dream to get to the Olympics." Helping Laing on the road to achieving his dream was his wife, Jennifer Jones, who won a gold medal as a member of the Canadian women's curling team at the 2014 Winter Games in Sochi, Russia. Laing says being married to an Olympian has served as an inspiration. "It’s fun to watch somebody you love achieve their lifelong dream," he says. "It is also motivating to have somebody to talk to who is playing at the same level and going through the same ups and downs that every athlete goes through. It’s great to have that support on both sides." Heading into the Games, Laing says he also feels supported by his Olympic teammates. Laing won't be the only Laurier grad curling as part of the Canadian Olympic team in Pyeongchang. Laing shares a long-time friendship with fellow Laurier alumnus John Morris, who will compete as part of the mixed doubles competition at the upcoming Games and won a gold medal as a member of the Canadian men's team at the 2010 Winter Olympics in Vancouver. In addition, Laurier alumnus Paul Webster, also a former Golden Hawks teammate of Laing's, has again been named Canada's Olympic team leader for curling. "I look back on my Laurier days and there's a lot of great memories," says Laing. "I met a lot of great people and we had a lot of great times competing on the varsity team." Laing and Morris share a bond that goes back to their days as junior teammates, when they twice won the World Junior Championships together. The pair also played together as Golden Hawks and were roommates for close to three years while in university. "It will kind of bring everything full circle," Laing says of the upcoming Games. "I was curling on a junior team with John when the Olympics first became a possibility. The steepest part of my learning curve in curling happened with John at my side and we first dreamed about the Olympics together. "John is still a good friend and somebody I respect a lot in the game. The curlers will walk out together and probably hang together during the opening ceremonies, so it will be cool to walk out with somebody who this dream started with 20 years ago." Laing, who grew up in Meaford, Ontario, says it's hard to express the emotions he felt when his team qualified to compete in Pyeongchang. Members of Team Koe will gather before the Olympics in Japan, where Webster will join them for final preparations. After that, it's a short flight to South Korea, where Laing's 20-year dream will become reality. "What I always tell people is that it's impossible to dream too big," Laing says. "The Olympics have always been a huge motivator and a powerful symbol for sports and for humanity in general. When you attach something to the Olympic dream, it becomes pretty motivating." The Winter Olympics take place in Pyeongchang, South Korea, from Feb. 9 to Feb. 25. The men's curling competition takes place from Feb. 13 to Feb. 24.